It may seem a little odd to see me support some politician. However, I do feel the need to acknowledge this next individual and the contributions she has made. As a strong advocate of Vietnamese Democracy, Ms. Loretta Sanchez has done much work to help the Vietnamese community overseas. For all of you who don’t know, Ms. Loretta Sanchez is a Congress Representative for the state of California. On numerous occasions, Sanchez has lobbied the U.S. government on behalf of the Vietnamese people. Even today she continues to fight for the goal of human rights. Loretta Sanchez has taken part in many democratic protests, even opposing the Communist government on their own soil. 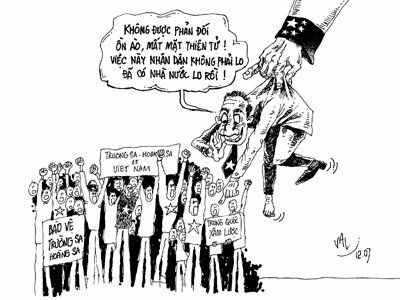 As a result of her open disapproval to the Vietnamese government and talking to the dissidents, Sanchez was kicked out of Vietnam. Just this week, Representative Sanchez wrote a letter signed by three other House representatives to Secretary of State Hilary Clinton. The contents of the letter urges Mrs. Clinton to address a number of human rights issues on her visit to Hanoi in the next few days. This is a short summary of the many contributions made by Ms. Loretta Sanchez to the Vietnamese community. Her list of good deeds far surpasses that of her competitor, Van Tran, in the Senatorial race. She is a friend and ally of the Vietnamese community, and I would like to take a moment to acknowledge that. If any of you would like to subscribe to this blog, you now have that option. Thanks to a reader’s request, I have decided to add a widget for subscriptions, which you can find on the right side of this page. How do you subscribe? It’s really easy! All you have to do is enter your email address, then click on the Sign Me Up! button, and viola! You are now a subscriber to Freedom For Vietnam! Why subscribe to Freedom For Vietnam? Subscribing is the best way to keep yourself updated on the latest posts. You will receive the latest article via email, as soon as it’s published! Obviously, this won’t cost anything and you can unsubscribe anytime you want. Just thought I should make that clear. Thanks for visiting everyone, your continued loyalty is much appreciated! According to Reuters, the nine fishermen who failed to return home on wednesday were found drifting in the sea. Luckily, they are still alive and have been taken to safety along the Paracel archipelago. The Vietnamese government said that the fishermen’s engine had died, so they used their blankets as sails until a Chinese patrol vessel located them and took them to safety. 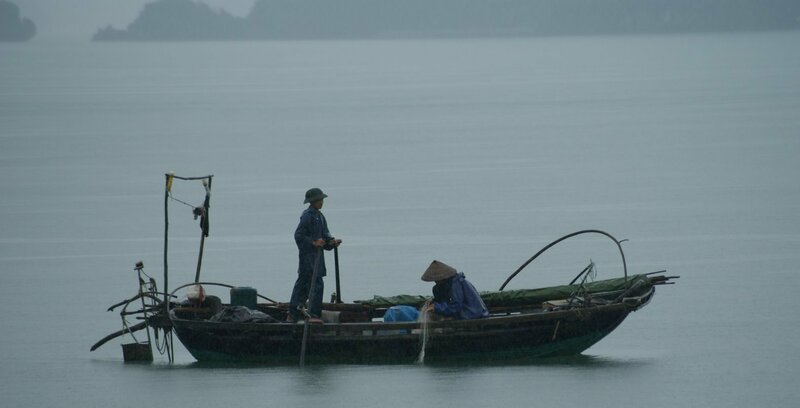 When the fishermen never made it back, the Vietnamese government called out China to help in the search. Luckily. the fishermen held on until the rescue vessels found their trawler. This is good to hear, as long as it’s all true. Whether they’re back in Vietnam or still waiting on the Paracel Islands is unknown. Hopefully the workers will find their way home to their families as soon as they can. The fishermen that China promised to release from custody last week never made it home. The nine fishermen detained by China on September 11, 2010, were expected to reach Vietnam on Tuesday, Wednesday at the latest. Their non-arrival was quite a shock, since the fishermen have been “released” by the Beijing government quite some time ago. At the moment, there is no news of their whereabouts. According to AsiaNews, the fishermen’s families have tried contacting their boats, but didn’t get a single response, even after numerous tries over the past few days. The fishermen’s families, along with the officials in Vietnam, are questioning China’s efforts in ensuring the safety of the fishermen. Many believe that it was never China’s intention to let the fishermen home safely. The adequacy of the boat, along with the amount of fuel and communication devices provided by the Chinese have been put into question. The situation is horrid for the families of these fishermen as they wait for their main supporters to return. Our thoughts should go out to the families of these fishermen. Let’s hope that somehow, they will make it back to Vietnam. This is unacceptable on China’s end. It is obvious that they only said they would release the fishermen to appear humanitarian for the meeting of the defense ministers last week. It seems that they had ulterior motives, planning to let the fishermen get stranded at sea. This is China’s way of retaliating for Vietnam’s objections against the crimes of the Chinese navy. This just goes to how cruel, yet cowardly, the Beijing government really is. Just two weeks ago, China was protesting Japan for detaining Chinese naval officers, only to turn around and murder the fishermen of Vietnam. The difference is that the Vietnamese detainees are innocent civilians while the Chinese detainees are not. Those who were arrested by the Japanese were members of China’s military, attempting to bully the civilians of Japan. It is an understatement to call the Chinese’ actions ironic, killing innocent people of their neighboring countries, and then blatantly placing blame on those who are unafraid to bring them to justice. They prey on the innocent, then play the victim when challenged and embarrassed by the individuals who are capable of fighting back. It does not matter to me how strong their economy is, or how powerful their army and navy are. If China does not respect international law, disregards the livelihood of weaker nations, and lies shamelessly in the face of the world community, why should we respect them? They are truly pathetic, just like the Communists in Vietnam. Here is the trailer for the upcoming motion picture Lý Công Uẩn: Đường tới thành Thăng Long (Lý Công Uẩn: The Road to Thăng Long Citdel). Notice the absence of anything even remotely Vietnamese in this movie, except for maybe the language. The clothing is Chinese, the architecture is Chinese, and almost everything else is Chinese. If you have ever seen a Chinese historical drama, you would know exactly what I mean. I am not criticizing the quality of the movie, because this is obviously a big budget production. It looks like both Hanoi and Beijing, mostly Beijing, are sinking enormous effort into this movie ($100 billion Vietnamese). They can’t expect to brainwash the population with cheap production values, can they? Here is the trailer for Lý Công Uẩn: The Road to Thăng Long Citadel. It is in Vietnamese, so don’t worry if you don’t understand. 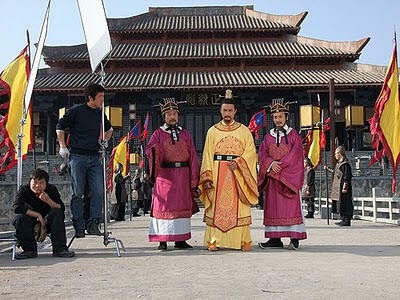 Currently in development is a motion picture/television series based on the life of Lý Công Uẩn (aka Lý Thái Tổ), the first emperor of Vietnam’s Lý Dynasty. The title of the film is Lý Công Uẩn: Đường tới thành Thăng Long (Lý Công Uẩn: The Road to Thang Long Citadel). The producers of the movie will be the Communists in Vietnam, but for some odd, disturbing reason, the directors of the movie will be from China. Somehow, the artistic content of the film will be entirely controlled by the Chinese Communists and not the people of Vietnam. According to Taipei Times and Daily Vietnam News, Emperor Lý Thái Tổ will be dawning Chinese garments, reigning in a Chinese style palace, and surrounded by Chinese officials. The film will also be shot in Zhejiang Province, China, employing numerous Chinese actors and extras. It’s not hard to tell what is happening here, the Chinese are trying to make Lý Thái Tổ look like a Chinese person. Not only that, but they are also trying to repaint the appearance of Vietnam, changing every aspect of the country into resembling a Chinese entity. 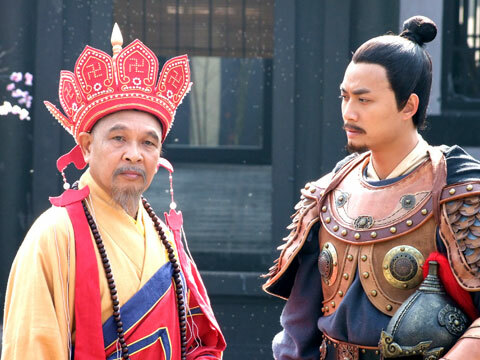 The Beijing government has taken full artistic control of this movie, planning to distort the history and mislead the less-informed into believing that our forefathers were descendants of the Chinese. What I find really troubling is how the government in Hanoi is allowing this to happen. Don’t they understand what the Chinese Communists are doing to the history of our nation? Lý Công Uẩn is one of the most important figures in Vietnamese history, founding the Lý Dynasty, establishing the city of Thăng Long (medieval Hanoi), and leading the country into an era of great prosperity. China is re-writing the history of our nation and desecrating the integrity of one of our proudest historical figures. If you have been paying attention to the points I’ve been making throughout, you will know that such blatant fabrications on the Chinese end is nothing new. This is historical distortion at its worst. Hopefully someone smartens up and brings an end to this problem. If not, the people of Vietnam will make it right.